MyPC is a compact and portable system information tool for Windows. The program organizes its features across multiple tabs: "CPU", "BIOS", "Motherboard", "Network", "APM/ Sound" and more. Browsing the panels reveals all the usual sysinfo basics: CPU, GPU, network adapter, BIOS, motherboard, sound card and so on. Other tabs give you extra functionality. The "Network" tab doesn’t just list network adapter details: it also allows accessing an FTP server, running an IP WhoIS or opening an IP address. The "CPU" and "Memory" tabs not only give you the technical specs, but also display the current system load. 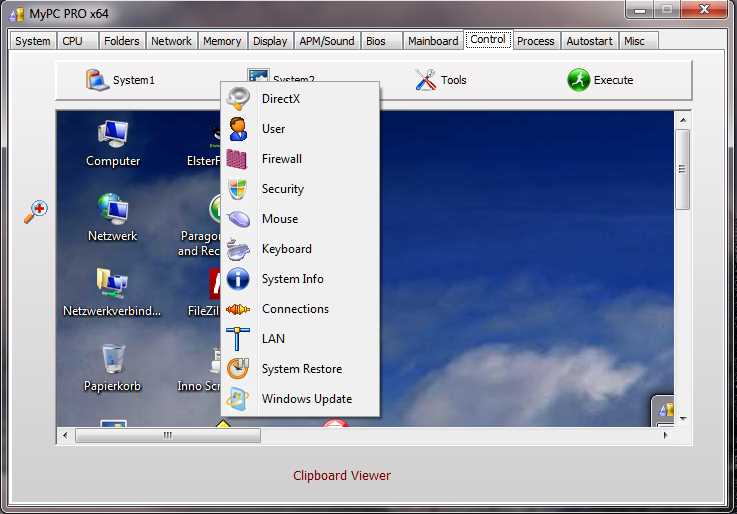 A "Control" tab acts as a compact launcher for firing up standard Windows tools: Explorer, Control Panel applets, Regedit, the command prompt and more. An "Execute" button runs common tasks in a couple of clicks. You can clear the clipboard, empty the recycle bin, enable or disable system restore, set a system restore point, and more. The "Folders" tab acts as a separate launcher for system folders. System, Startup, AppData, Temp and other folders can be opened in Explorer with a click. The "Misc" tab has a couple of random bonus features in a date/ time alarm, and a stop watch. There’s also a "Cleaner" function which runs some basic disk cleanup tasks. This ran with a German language interface, though, which might be a little inconvenient for some. Put it all together and although MyPC doesn’t really excel in any area, it’s a likeable mix of functions which deserves a place in your portable toolkit.